Proliferation of mobile devices has led to a dichotomy between ease-of-use and security and is becoming a major concern for the financial institutions and end users. With surge in incidences of identity thefts and data breaches, consumers and businesses are becoming more concerned about protecting their data while processing transactions. As smartphones are increasingly replacing various accessories such as calculators, cameras and flashlights, customers continue to remain reluctant to swap their wallets with their pockets for digital counterparts. Moreover, high-profile retailer data braches are making has led to apprehensions of sharing the information of their credit cards. Growing advancements in the mobile payment security have eased the trepidations of the businesses and consumers to an extent. In order to offer secure mode of transaction to customers, companies are introducing tokenization, which safeguards customer’s information while conducting the transaction. 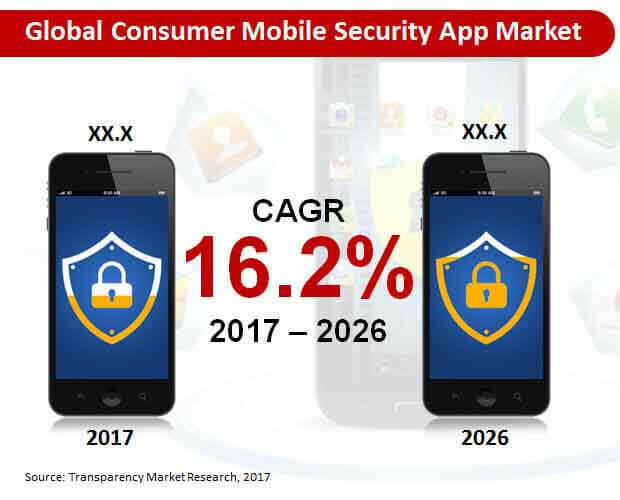 According to Transparency Market Research, the global consumer mobile security app market is expected to represent a value of nearly US$ 13,000 Mn by the end of 2026. As more organizations and companies are going mobile, the executives and managers continue to look for better solutions. Moreover, communication continues to be an important aspect in an organization in order to conduct business and convey critical information. Increasing demand for the security breaches while communicating with the clients and other members of the organization could lead to significant losses. Growing need to secure the information communicated among the organization members and clients has led to surge in demand for consumer mobile security apps globally. In order to ensure robust security, manufacturers are developing consumer mobile security apps in line with the Mobile Application Security Verification Standard (MASV), which is increasingly used by the software developers and architects to ensure the consistency and completeness of the test results. Moreover, leading tech giants are increasingly focusing on offering mobile applications services for the Android users, which will indicate a warning signal when other apps and websites collect information and personal data without the consent of the end users. Further, increasing number of organizations are opting for applications that are developed with a weak database. Mobile applications with weaker database and security enables the hackers to conveniently retrieve personal information of the customers. Capitalizing on this, the leading tech giants are developing applications that can allow the end users to monitor transaction of information and if the data is being retrieved in stealth. However, some of the mobile consumer mobile security apps are incompatible with various versions of the mobile phones. Moreover, various applications are checked by a stringent approval system before they are launched for the end users. Bound to these factors, the global market growth of consumer mobile security apps is likely to witness an inhibiting growth. With the growing need to secure user information and data on the mobile phones has led to increasing demand for applications that can be integrated according to the requirements of the end users. On the basis of type, the integrated app segment is expected to represent the highest revenue growth, accounting for a value of nearly US$ 3,000 Mn by the end of 2026. On the other hand, the standalone app type segment is expected to register a robust CAGR during the forecast period. Based on operating system, the android segment is expected to generate significant revenues, recording a value of over US$ 2,000 Mn by the end of 2026. However, the iOS operating system segment is expected to register the fastest growth in the global consumer mobile security app market throughout the forecast period. Leading market players operating in the global consumer mobile security app market include Symantec, TrendMicro, VMWare Airwatch, TrustGo, Norton, Sophos, McAfee, AT&T, ZoneAlarm and Webroot. Transparency Market Research has developed an exclusive forecast study on the global consumer mobile security app market for the assessment period, 2017-2026. Increasing penetration of smartphones and growing incidences of cyberattacks have been observed as the crucial factors necessitating the need for consumer mobile security apps. Factors as such have been addressed in the report to deliver accurate forecast on the value of the global consumer mobile security app market for the upcoming decadal period. The report stands apart for delivering first-hand information in the form of profound analysis. Custom formulas have been used to develop precise evaluations on the segments and the regional consumer mobile security app markets. Furthermore, interviews with company representatives have been conducted to validate the analysis provided in the report. Key insights on development of consumer mobile security apps, technology trends, competition strategies, cyber threats, and existing security vulnerabilities have also been discussed in the report. The overall study forecasts how the adoption of consumer mobile security app will gain traction in the immediate future, providing insights on segments most lucrative for business growth of the market participants. The report has analysed multiple aspects of consumer mobile security app to cover the global market comprehensively. Firstly, factors influencing the dynamic growth of the global consumer mobile security app market have been addressed and analysed. Drivers, restraints, trends and growth opportunities have been disclosed to create a broader perspective on the subjective undercurrents of the global consumer mobile security app market. Companies have been extensively profiled in the report and an overall competition landscape of the global consumer mobile security app market has been revealed. Information of their current market standings and strategic developments have been provided in the report as well. An analysis on pricing, cost structure and technology sourcing strategies has been offered in the report. Another highlight of the study is the provision for intensity map that reveals the presence of each company across several regions. Furthermore, the report has also decoded the supply-demand scenarios and provided an analysis on how consumer mobile security apps will be developed in the upcoming years. The global market for consumer mobile security app has been analysed and segmented on the basis of the following taxonomy. The study also provides additional information on cross-segmented analysis and country-specific forecast for consumer mobile security app market. At Transparency Market Research, a team of analysts, subject matter experts and research consultants have put in weeks of heavy researching for development of this report. Being a credible business document, this study is sought by companies partaking in the global consumer mobile security app market. In development of this report, analysis has been performed across different levels and multiple parameters. Data collected from key market participants reveals their net revenues for the past years, and has been aggregated to create baselines for market size evaluation during the historic period. A stronger base for readers of the report is created by universalizing the market size estimations into US dollars (US$) and interpreting them in commonly-used metrics such as compounded annual growth rates, absolute dollar opportunities, year-on-year growth rates, and basis point share index. Secondary research has been employed to create information on the overall industry scenario, prominent strategies and manufacturing trends. By availing this report, key players in the global consumer mobile security app market can develop informed strategies after assessing the inferences provided in the report.